Embedded within the Casuarina Beach development, the HPC is a private cell within in a quasi-public territory along Mainwaring Drive. As such it treads a fine line between public and private. The building has been drawn forward on the site to occupy and engage with the street-scape. The elevated boardroom can be sighted at a distance above the tuckeroo lined street, drawing people along it’s length and allowing the building to ‘complete’ the street edge. A sense of the informal is evoked by the composite construction and porous nature of the ground floor plan. This reflects upon the internal culture of Surfing Australia and the external beach culture present at Casuarina. Priority is given to outdoor connections and a double height void over the ‘central courtyard’ which is at the core of the plan. This void sits along another axis which runs south to north, linking a chain of visually connected public spaces which run along the interior of the site parallel to the street. 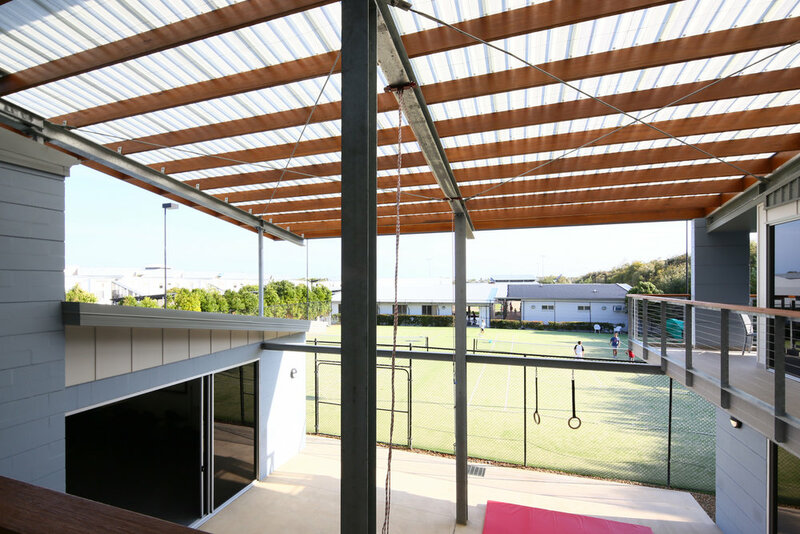 The pool, gymnasium and tennis courts are all received into the double height courtyard. The massing is broken down along the northern elevation to reflect the scale of the surrounding neighbours, with the bulk of the building directed towards the west into a screen wall of extensive site planting. The Acoustic amenity of the neighbours to the north have been considered in the placement of building and internal planning arrangements.